Pattie Cagney Sheehan: Second Act is located within Flourish Studios, on the mezzanine level, as an intimate, private boutique where breast cancer patients and survivors are fitted for post-breast surgery garments and prostheses. This includes silicone and non-silicone breast prostheses for women who have had mastectomies, lumpectomies or reconstruction. Second Act also carries specially pocketed bras designed to hold the prosthesis. These come in as wide a range of styles and sizes as you would find in any intimate apparel boutique. Related, pocketed items include tank tops, swim suits and t-shirts. Second Act is also a great resource for women who have difficulty finding a well-fitting and supportive bra, even if they have not had cancer surgery. In addition, Second Act carries a large inventory of Raquel Welch and Gabor wigs for women experiencing hair loss from chemotherapy or for any reason. Or for women who just like to wear stylish and well-fitting wigs. We also carry hats and scarves in a range of style and materials but all are selected to be soft and comfortable when worn and to camouflage a woman’s hair loss. Second Act operates by appointment. Insurance and Medicare are accepted and we file the paperwork. 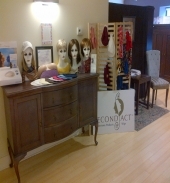 Pattie: Second Act is s downtown Chicago’s only ABC accredited cancer recovery boutique carrying post-breast surgery garments, prostheses and wigs, in stock and ready for women to take home upon completing their visit. The owner, Pattie Cagney Sheehan, is a BOC Certified Mastectomy Fitter and a member of the American Association of Breast Care Professionals. She is also one of only a few Certified Mastectomy Fitters, in the Midwest, trained to fit custom prostheses. She meets with each lady in an intimate studio environment where they can learn about the products and be fitted in complete privacy. Pattie: Second Act carries mastectomy products from specialty companies Amoena, American Breast Care, Trulife and Anita. We also carry hats and scarves from Parkhurst, Cheri, Wallaroo and A Perfect You. Our wigs are from HairUWear, the only distributor of the Raquel Welch and Gabor lines of wigs. Our customers are in time-sensitive situations so the most important vendor characteristics are online ordering, timely delivery (within 2-3 business days) and avoiding out-of-stock situations. A minimum net 30 days is also critical as most of our customers’ purchases are paid to Second Act by Medicare and/or private insurance carriers making cash flow an issue. Pattie: In bras, smooth cups with no underwires are a popular choice. They also must be pocketed and supportive enough to securely hold a prosthesis. Front closure bras are also helpful for women with limited mobility. Any apparel, such as swim suits, tank tops, t-shirts and such that are pocketed and can hold a prosthesis are very well received. Hats and wigs need to be in colors and styles that are currently on the runways. Our customers prefer synthetic wigs as they are easy to wear and require very little styling but they must have good movement and a soft, natural feel. For those women who can afford them, hand-tied tops with lace fronts are preferred. Pattie: To a great extent our prices are controlled by our contracts with Medicare and private insurance carriers. Pocketed bras start at $40 and go up to $60. Non-silicone prostheses range from $45 - $200. An off-the-shelf, silicone prosthesis is $325 - $375, while a custom prosthesis is $3300. Wigs range from $200 to $500 and hats and scarves are $19 - $50. Pocketed swim suits are $85. There is no average size. Our bras range from 32AA to 50E and prostheses correlate accordingly. Likewise, wigs are generally average size. Pattie: Our customer is female, age 30 – 80. The driving feature of our customer is someone who is facing breast cancer surgery, has recently undergone this surgery, who is referred by her physician’s office or who finds Second Act via internet search. We also see breast cancer survivors, of indeterminate age. Ted: What else can you tell me about your business? Pattie: Obviously Second Act is not your usual retail store. Because our focus is breast cancer support it is extremely personal and intimate. We occasionally see a walk-in customer but we primarily work by appointment and generally schedule 1 hour for each lady. Our private, studio setting does not lend itself to browsing. Once someone becomes a customer of Second Act they generally return once or twice a year for replacement items.